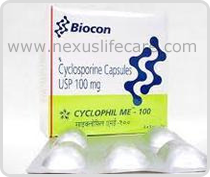 Uses:- Cyclophil Capsules is used to prevent organ rejection in people who have received a liver, kidney, or heart transplant. Cyclosporine Medicine Oral is used to treat the following: Severe Psoriasis that is Resistant to Treatment, Rheumatoid Arthritis, Body's Transplanted Organ, Prevent of Transplant Rejection, Prevent Kidney Transplant Rejection or Prevention of Liver Transplant Rejection. Side Effects:- Kidney damage, convulsions, liver damage, tremor, hirsutism, gingival hypertrophy, hyperkalemia, f luid retention, increased susceptibility to infections, GI symptoms.